In 1901 cousins Everett and Clinton Cushman of Lincoln, Nebraska applied for a patent on a seal to prevent compression leaks on small two-cycle stationary engines. 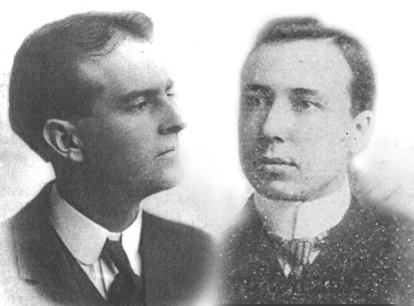 They’d been building and working on farm machinery for some time; both had attended the University of Nebraska and although the younger Everett had “…went in the front door and out the back” according to his grandson Robert, Clinton graduated with a degree in electrical engineering in 1902. 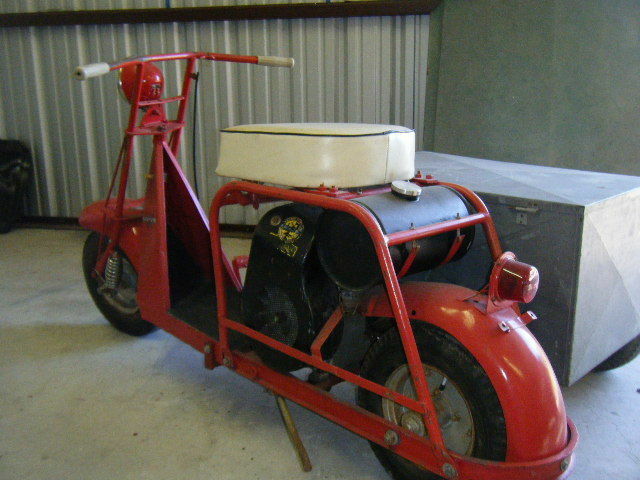 That same year their patent was approved, and the duo filed articles of incorporation as the Cushman Motor Company on September 18, 1902. Working out of the basement of a building on the northwest corner of 24th and O streets, the pair struggled to make a living from building engines for farm applications. At the same time they were both avid boaters- a difficult prospect in landlocked Lincoln- and were constantly working on modifications for a marine engine. 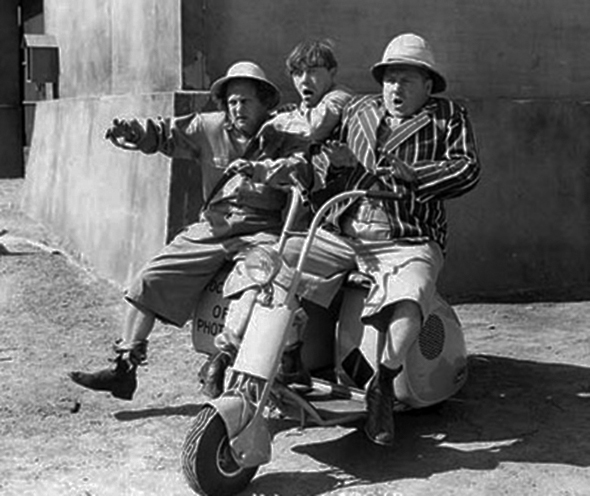 When Everett saw an advertisement for a single-cylinder outboard engine competition the cousins entered a 2hp version of their two stroke and took first place. The Rudder, a popular power boating magazine, ran an article about the race which gave the Cushman engine some much needed PR, and they began to develop a reputation for power and reliability. 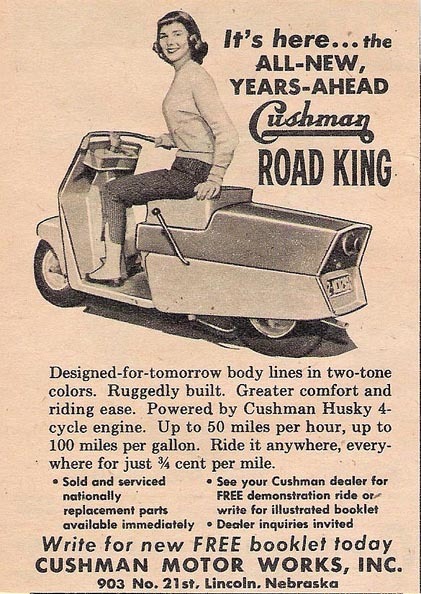 But the overall demand simply wasn’t enough to make Cushman a major name. By 1906 the company was struggling to stay afloat and the next three years saw little in the way of advancement. 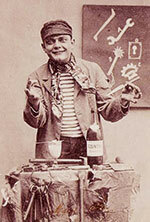 But in 1909 the cousins brought in Everett Brown Sawyer, a young salesman with a strong background in engineering. As general operations manager Sawyer quickly realized the growth potential in the agricultural market: farmers were actively seeking new means of mechanizing production. Clinton and Everett were persuaded to put their marine line on the back burner and developed a new line of 4 stroke, high speed water cooled engines which developed a solid reputation around the Midwest. In 1910 the company turned an actual profit of $12,000 and was incorporated as the Cushman Motor Works: in 1913 they broke ground on a new foundry and factory on 21st Street in Lincoln. World War I opened new military and foreign markets, along with a dramatic increase in demand for electricity; with some modifications to their 4hp binder engine Cushman began producing portable “electric light plants”, small enough to be popular with individual farmers but also in demand from small electric companies and the government. 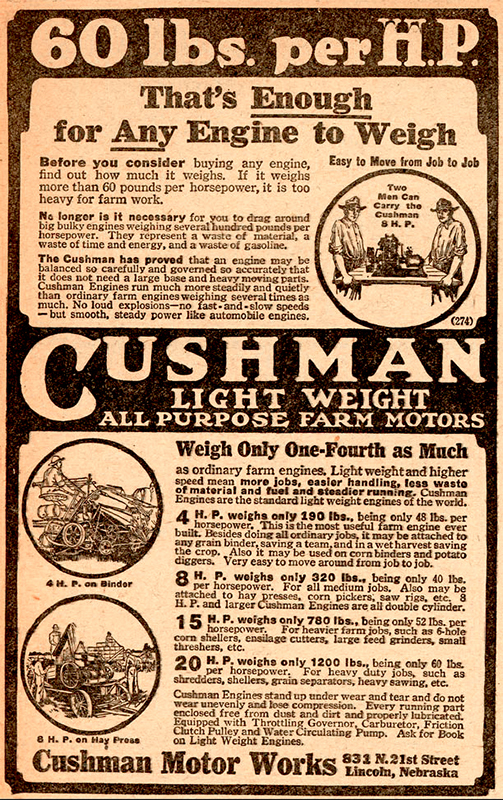 By 1918, sales had risen to $1.5 million and the company opened a Canadian branch in Winnipeg, Manitoba; Cushman engines were powering everything from hay presses to washing machines. But the drop in military contracts at the end of the war coupled with the farm depression in the early 1920s signed a death knell for the company: despite a line of new engines even Sawyer was unable to pull sales back up. Everett Cushman left the company in 1919 to start the Cushman Engineering Company in California with his son Clifford, then later joined Piersen Manufacturing Co. in Topeka, Kansas. Clinton Cushman’s fate after 1919 is unknown. Everett Sawyer ran the company himself until was forced out by creditors in 1927, when a management firm controlled by outside creditors took control. In 1933 Charles Ammon was running the Easy Manufacturing Company in Lincoln, just down the street from the Cushman Motor Works (the Cushman foundry had been a major supplier of castings for Easy). The onset of the Great Depression allowed Ammon to acquire the remains of Cushman at a bargain and they quickly adopted the Cushman name for their own line of small multi-purpose engines, capitalizing on the already established reputation. 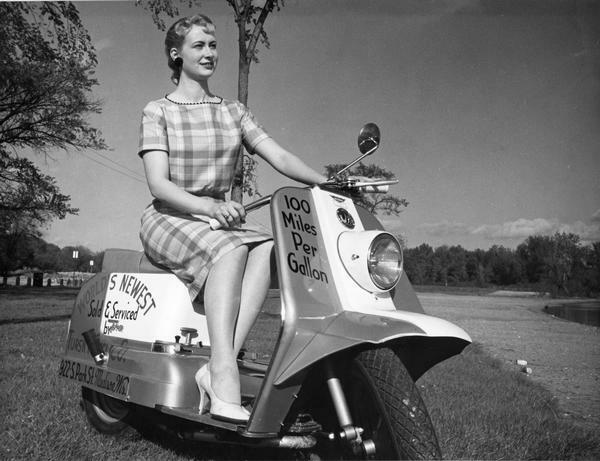 About 1935 the new company bid on a contract to supply scooter motors to the California-based Motorglide Company. 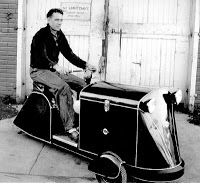 Ammon lost the original bid, but he had learned enough to conclude that there must be a market for scooters and by October 1936 the first Cushman scooter prototype, the R-1, was ready for production. 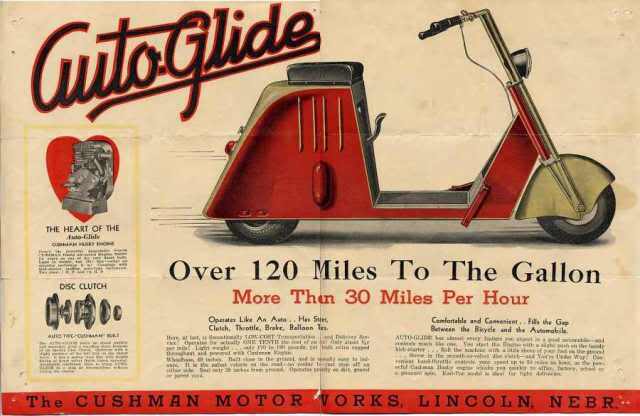 Renamed the “Auto-Glide“, the machine featured a 1 hp. (11⁄2 hp. 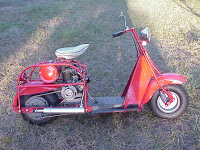 optional) Cushman “Husky” 4 stroke with a wet clutch system, primitive automatic transmission, chain drive and an advertised top speed of about 30mph. 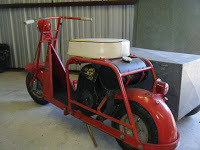 With the addition of the optional “Kari-Pac,” a sort of bin which attached to the rear, the scooter found commercial use as a small delivery wagon that could hold up to 100 pounds. 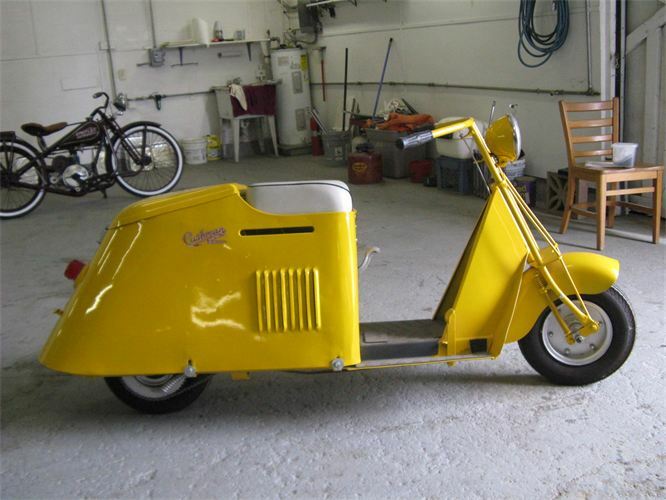 Although initial sales were low the company soon began offering a variety of new options including larger engines and cargo boxes in various configurations, including a sidecar and a front end delivery box. 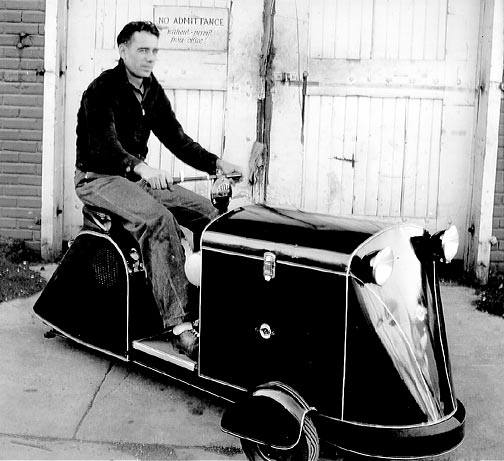 One of the more elegant designs was the “Kar” model 29, a 3 wheeled full chassis vehicle introduced in 1939. 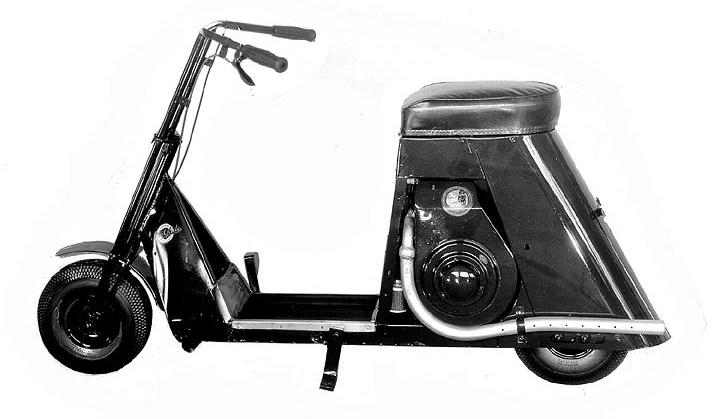 Their 3 wheel design would later prove to be the company’s most successful configuration. 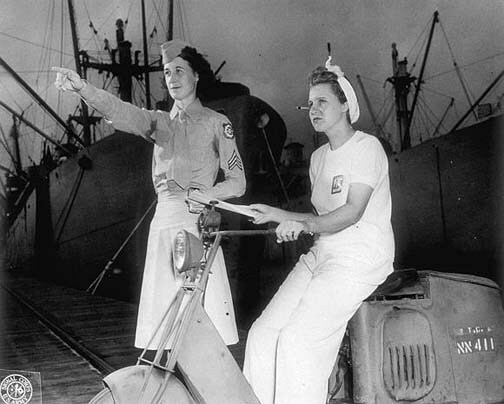 After America officially entered World War II in 1941, Cushman was one of the few manufacturers of motorized vehicles allowed to continue civilian production: the carts and scooters were considered “energy savers” for those needing efficient transportation to jobs. While the factory began production of bomb nose fuses (over 8.5 million produced during the war, and given the Army and Navy “E” awards for outstanding quality and quantity), the military also found an immediate need for lightweight, dependable and economic transport both on base camps and in the field. More than 15,000 Cushman two and three-wheeled vehicles were commissioned for use by all branches of the armed forces. In 1944 the Model 53 Cushman Airborne was introduced: a heavy 255lb. rigid framed machine with a stock 4.5 hp “Husky” motor and non-syncromesh 2 speed sliding gear transmission. The Airborne’s top speed was 45 mph, but the heavy, solid frame produced a bone jarring ride on anything besides smooth tarmac. The machine was designed to be airdropped by parachute or carried by glider, and it had a hitch to pull a model M3A4 general-purpose utility cart. The cart could be converted to carry .30 or .50-cal. machine guns or an 81mm mortar, though performance was sketchy under any kind of heavy load. 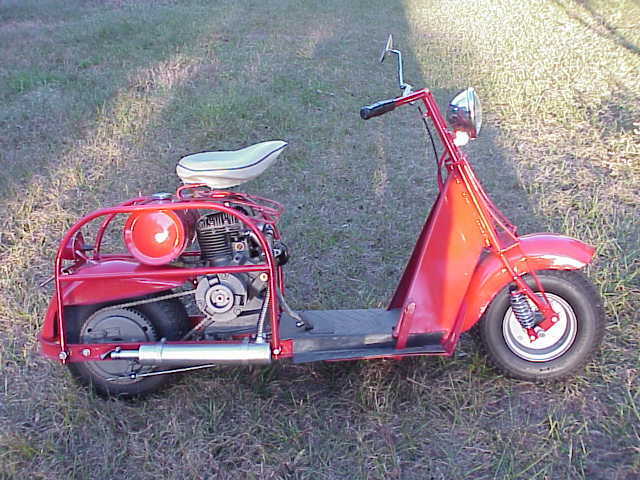 Reportedly the Army engineers also made a serious weight miscalculation when allocating the parachute size for the Cushman, and as a result the scooter hit the ground with enough force to bend the frame in half. 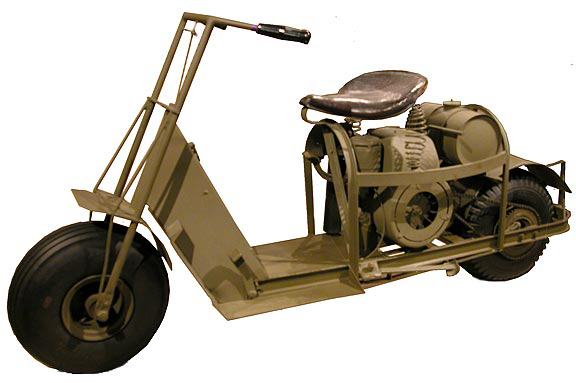 Utilizing typical “Army intelligence”, rather than simply using a bigger parachute they contracted Cushman to modify the Airborne with a large spring-loaded bumper that wrapped around the frame section of the scooter, adding another 50 lbs. in the process. This resulted in an Airborne with bent frames and bumpers, hardly the improvement they were seeking. 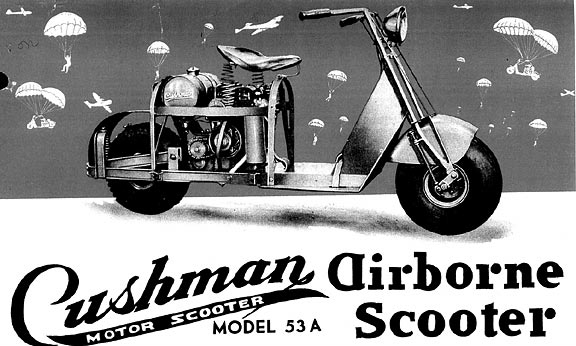 The whole parachute program was scrapped, but Cushman still made nearly 5,000 airborne scooters for the military. The rugged, simple Model 53 could travel through a foot of water, climb a 25 percent grade and had a range of about 100 miles. After the war the Airborne was modified with swing-arm rear suspension and sprung trailing link forks, and sold on the civilian market until 1954 as the model 53-A. 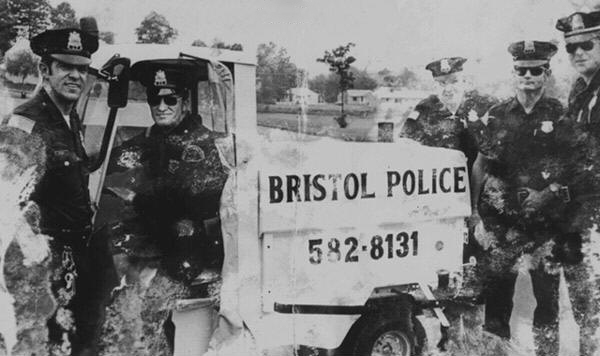 Many of them were re-purposed for use by the postal service and police departments after the war. Following World War II, Company President Charles Ammon started a union in an apparent attempt to block worker support for outside union representation. But in 1946 the Cushman factory workers chose the UAW-AFL to represent them, and the first one-year contract was signed Nov. 14, 1946. In 1947 control of the company passed from Charles Ammon to his sons; Robert, who became president, and William who served as vice president. 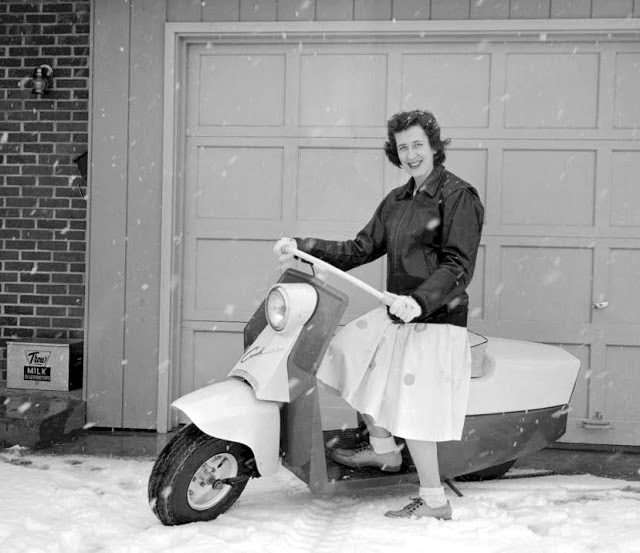 Soon after Robert Ammon became president the plant converted to a small-scale assembly line modeled on Detroit’s auto manufacturing principles; Ammon told Business Week magazine in 1950 that he liked to think of Cushman as “…the General Motors of scooter production”. Several new models were introduced to the production line from 1946 through 1950, including the Pacemaker and Roadking models (1946), the Sears Allstate (1948) and the Highlander (1949). In 1950 Cushman Motor Works employed 750 people; that same year the company introduced the Eagle, which would prove to be their most popular two wheeled model of the era. 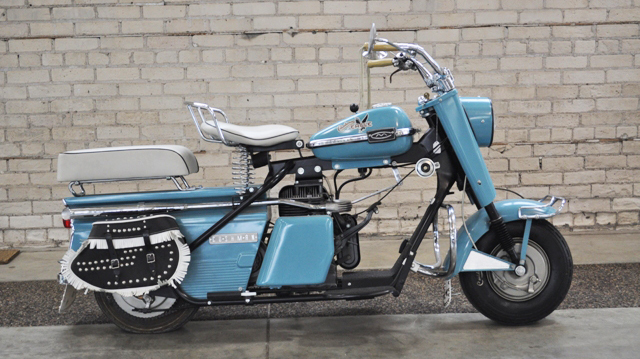 The Eagle copied more conventional motorcycle designs with its “naked” engine, sprung saddle, contoured fenders and teardrop fuel tank: even whitewall tires were available. 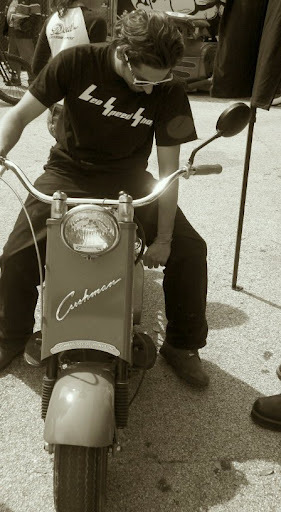 With a 318cc, 8hp flathead single cylinder, the scooter further burred the lines between scooters and motorcycles: combined with a two-speed transmission, the machine could boast 50-plus mph. 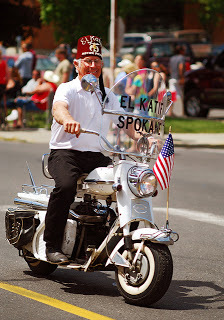 Unexpectedly, the Eagle soon became an icon of Shriners’ groups (an offshoot of the Freemasons), who made the little bikes famous by riding them in formation during civil parades around the USA. 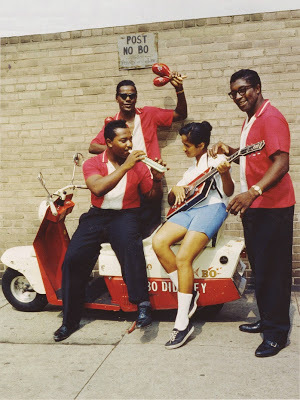 By the mid-1950s a specialized version of the Cushman Silver Eagle, featuring a slightly higher hp output and a few additional cosmetic features, had become the standard for many Shrine Temple “Cushman Motor Corps” throughout the United States and Canada. But in 1961 Cushman decided to phase out all production of two wheeled scooters, and by 1966 the last Silver Eagles had left the plant. 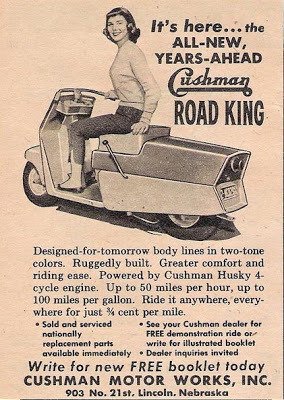 As defense contracts finally ended after the Korean War (Cushman had also been producing aircraft parts), the company began to focus new product modifications for industrial consumers. 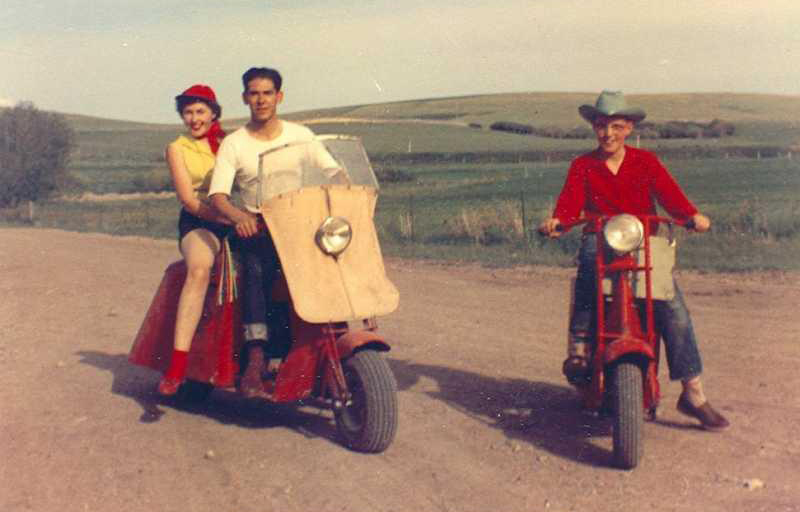 In 1952 they re-introduced a line of three-wheeled industrial vehicles dubbed the “Truckster“. In 1957 the federal Post Office Department awarded Cushman a contract to produce 1,500 modified Trucksters which would be known as Mailsters. 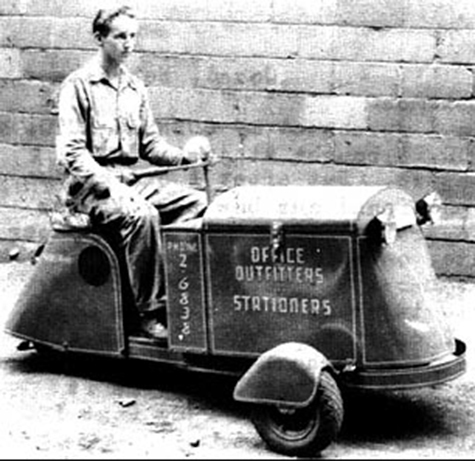 Within months of signing the contract to build Mailsters, the Ammon brothers sold Cushman Corporation to the Outboard Marine Corporation (OMC) of Waukeegan, Illinois. In a stock trade valued at $3 million, the homegrown engine manufacturer finally became a subsidiary of a firm best known for marine products; ironically, the original goal of Everett and Clinton Cushman back in the early 1900s. 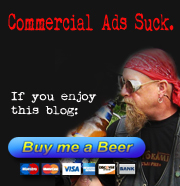 The Truckster was being used in dozens of industries along with more visible roles in the Postal Service, “Meter Maid” parking enforcement and private security sectors. In 1965 the Welding Journal reported that the New York Central railroad was using the 50-inch wide Trucksters as mobile welding units in Chicago, making repairs to passenger coaches; scores of them were used at the 1964 New York World’s Fair, and even the Pentagon reportedly had a Cushman outfitted as a fire truck. 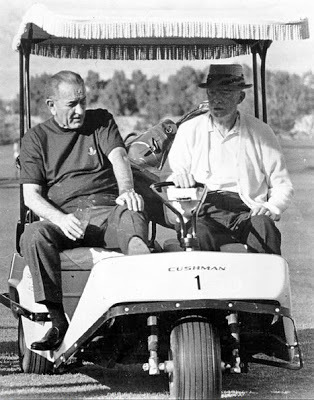 Dwight D. Eisenhower and LBJ in a Cushman Golfster, 1960s. Cushman had also used the three wheeled frame with an electric motor to produce a “Golf Car” which was originally introduced in 1955. 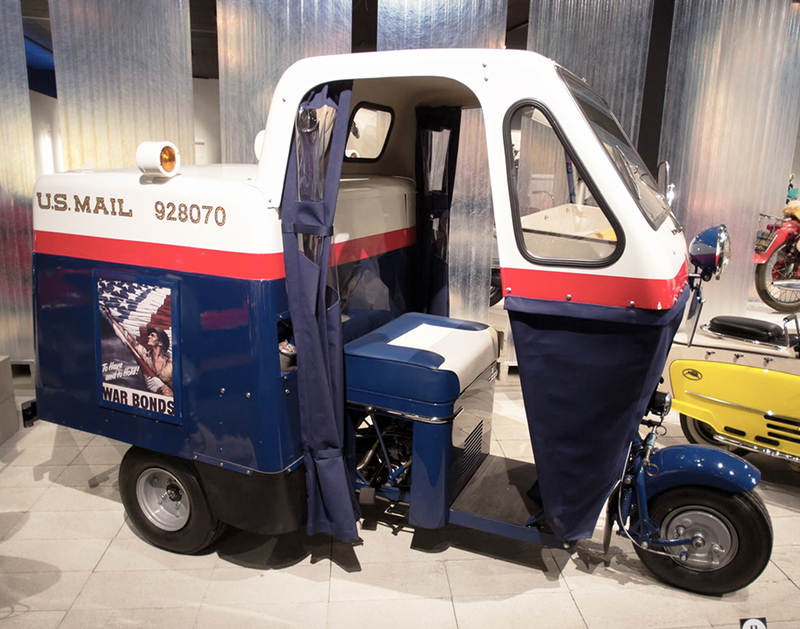 In the 1960’s this little open machine, now known as the Golfster, got a PR boost from President Eisenhower, an avid golfer who began relying on the little vehicle after he suffered a well-publicized heart attack. An array of celebrity golfers and stars including Jackie Gleason, Bob Hope and Frank Sinatra soon had Cushman golf carts modified to reflect their personalities. 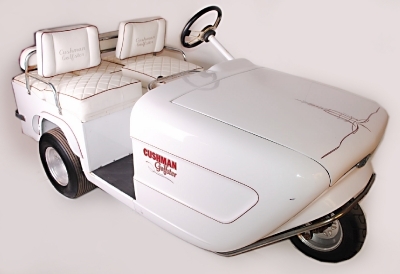 This created a publicity bonanza for Cushman, and combined with the increased leisure time for Americans and a corresponding increase in discretionary income the golf carts developed into something like a personal version of the truckster. But in 1973 6,087 Polish made electric golf carts were imported into the United States at “less than fair value”, accounting for 15 percent of the U.S. electric golf cart market. On June 27, 1975, Outboard Marine announced it would discontinue manufacture of its signature product; ironically, the Polish imports that brought down Cushman’s line were carbon copies of Cushman competitor “E-Z Go” golf carts, which is now, like Cushman, a part of the Textron conglomerate of companies. By the late 1970s the need for modernization at Cushman ushered in a burst of expansion at the Lincoln plant. OMC had consolidated equipment lines from Minnesota to Lincoln in 1977 and through the next decade they invested more than $40 million on the facility, upgrading machinery and engineering new products. Sales volume doubled between 1984 and 1989, which made the Cushman division an attractive property when OMC decided to sell it in 1989. Ransomes PLC, a British manufacturer of lawn and turf care equipment got the purchase but things began going downhill almost immediately: the company had almost bankrupted itself trying to raise the purchase capital, and they implemented “a management style that seemed to ignore Cushman’s successful track record.” Then a major recession hit the golf course industry, Ransomes bread and butter. Employment at the Lincoln plant dropped from 700 to about 400 within a decade. On Jan. 30, 1998, Textron bought the British company for $230 million and agreed to assume $60 million in Ransomes’ debt, part of which stemmed from Ransomes’ purchase of Cushman from Outboard Marine. 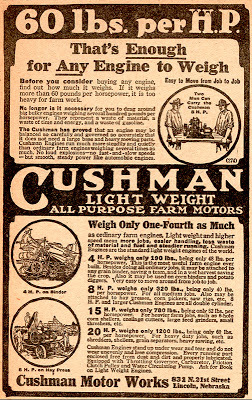 The sale brought Cushman into a global industrial company with aircraft, automotive, industrial, and finance divisions.